How to use Alli Orlistat? 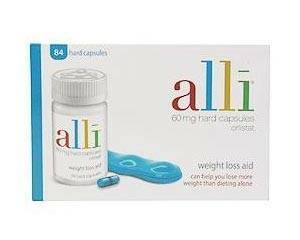 Alli is the only OTC drug for weight loss that is FDA approved. It has a non-systemic mechanism of action. The unique molecular structure of Alli enables it to bind to and inactivate GI lipases, which aid in the digestion of dietary fats (triglycerides). Alli binds to gastric and pancreatic lipases, blocking absorption of about 25% of consumed fat. Undigested fat is excreted from the body instead of turning into stored fat. The absorption of carbohydrates and proteins is not affected. Alli is not an appetite suppressant nor does it impact the heart or nervous system. It is minimally absorbed, and there is no residual effect once the drug is stopped. Alli is used together with a reduced-calorie diet and weight maintenance to treat obesity in people with certain risk factors (such as diabetes, high blood pressure, and high cholesterol or triglycerides). Take this medication exactly as directed on the label, or as it was prescribed for you. Take this medicine with a full glass of water. Take this medication during or within 1 hour after a meal that contains some fat (no more than 30% of the calories for that meal). Alli is usually taken 3 times daily. I am happy with the results of Alli. I found it to be a safe way of losing weight. Although I made sure to use it while eating a healthy diet and exercise I had the results I wanted.